Synopsis: This article examined the value that Blue Jays may derive from the flexibility of the players on their roster. The study was done from a manufacturing operations perspective, where production flexibility (the ability to move units between manufacturing facilities) is king. Lucky for me, that’s what I did before I came back to school for journalism, so this was right up my alley. Basically, if you want to produce X runs, being able to get those runs in a variety of ways or the ability to shift production from “plant” (player) to plant is valuable. Method: They created an optimization model using average injury rates and best and worst case scenarios, using models for fielding and regression. I won’t get into the details, but will summate in saying that I have questions and concerns about the methodology, but for the purposes of this article they’re not as important as the overall conclusion. (In fact, I don’t even use their methodology below, instead using a really back-of-the-envelope kind of thing to illustrate their points.) Basically, the authors were looking to see which teams had the smallest drop-off in expected run production (and runs saved defensively) due to injuries in the model. Results: There is value in platooning (Adam Lind alert!) and in having flexible rosters. Well, obviously. What was interesting is that the variation across teams was rather large. However, while their results focused on flexibility you could also question how much of that had to do with star power – for example, regardless of flexibility, losing Jose Bautistawould hurt more than losing, say, Jonny Gomes. Still, they illustrated pretty clearly that roster flexibility is a good thing. Not exactly ground-breaking, but it did make me want to take a closer look at the Blue Jays. The authors illustrated the value of platoon flexibility separate from injury-based flexibility, but we’ve kind of done that with the Adam Lind discussion of late, so I won’t dive much further into it. Basically, platooning players who are bad against a certain handed pitcher makes sense, so long as the platoon partner hits that pitcher type better. To display the value of flexibility, I’m going to make some pretty rough assumptions about player performance by using ZiPS projections for player performance for 2013. Again, we don’t care about the actual result, this is just an illustration of the value, and if anything it will underestimate the team’s actual potential gains. We also assumed the bench players could only play a single position when they came in. I also don’t have access to their injury projections, so my playing time estimates are also based on ZiPS. So again, this is the no-flexibility case, where bench players are only capable of playing one position and any other positions must be filled by call-ups who are, by definition, replacement level. Our next case is going to be one that allows flexibility – I’m still going to say “the starters don’t change positions” but allow our bench players to move around. It’s not a massive change, but already we’ve added 0.8 wins to our expected total just by being able to bounce our bench players around. 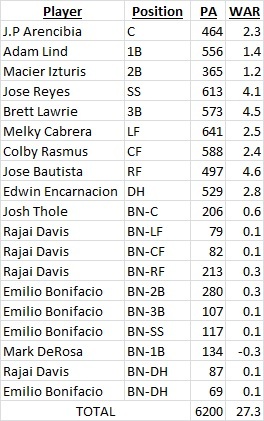 Beyond that, there is also flexibility in who starts and who platoons, and then flexing starters and reserves around (say, moving Bautista to first base if Lind were to get hurt in-game, allowing Davis to be the sub off the bench instead of DeRosa). I don’t have the time or desire to run a full optimization model like the researchers did, but rest assured that would add another fraction of a win. If that doesn’t sound like a lot, just consider how close many think the division could be this year. A single win could be the difference between playoffs or play-in, or play-in and watching. 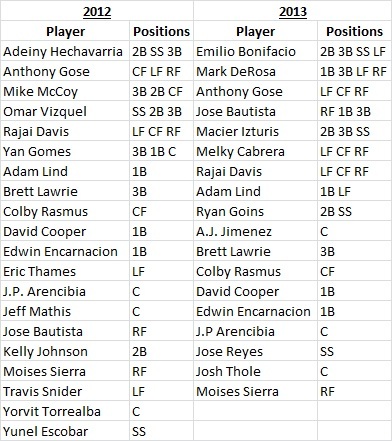 One final thing I wanted to highlight is that the Jays have clearly aimed to maintain flexibility on their roster this offseason. The chart below shows the players who played significant time last year and where they could be placed as a semi-reliable option (that is, they’ve played there before and weren’t chased out of the park with pitchforks and torches). It also shows this year’s projected players and where they can play in a pinch. This obviously isn’t a concept that is lost on Alex Anthopoulos or manager John Gibbons. In Gibbons’ previous stint, he flexed Reed Johnson around the outfield as a three-position sub while utilizing John McDonald, Russ Adams, Ryan Roberts and Frank Menechino as infield utility men depending on the year. You might not like those names, of course, but Gibbons has shown a willingness to manoeuvre guys around to get the best possible line-up out there. Now, all of this is a lot of poor-weather-planning, looking at how the team might benefit from flexibility in the event of injuries. But fractional wins matter in the AL East, especially since this balance and flexibility is something the Tampa Bay Rays do very well with. 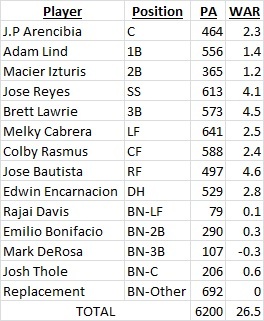 The Jays don’t have a Ben Zobrist, but they have a handful of regular players who can shift around to make sure a Mark DeRosa-type is minimized in terms of on-field impact. If bench flexibility alone can add nearly a win, it’s worth exploring and leveraging.